Hazardous Level: A Wasp sting can prove serious and even fatal. Unlike bees, wasps do not lose their stinger and as such, can sting you multiple times. Multiplication Level: An average of 1000 to 3000 eggs are laid per nest which hatch on a daily basis. There are numerous varieties of Wasps in Canada, such as the yellow jacket, hornet, and paper wasp. Colour ranges from black, yellow, brown, or white markings. The winged body measures 10-15mm long. Yes. A wasp sting, aside from being very painful can prove serious and even fatal. Seek medical attention immediately. The queen lays all eggs. Most eggs develop into sterile worker bees. An average of 1000 to 3000 eggs are laid per nest which hatch on a daily basis. What's the difference between a Wasp and a Bee? Bees are hairy, while wasps are long in shape. Generally, most bees can sting once as they lose their stinger. Wasps on the other hand can sting multiple times. Bees are useful as they pollinate flowers and such. 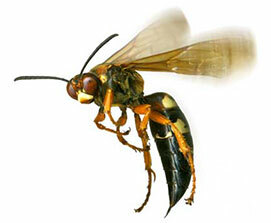 Wasps generally don't pollinate as they aren't furry, however they do eat other pesky insects. Wasps like meaty things like other insects, and BBQ scraps. Hornets, which is a type of wasps will actually eat bone (they reduce it to dust), so if you have dead rodents outside your home they will be attracted to it. (My professor at Mohawk College told our class this as he used to work as a forensic expert) Reduce wasps by limiting their food supply by cleaning up quick after family gatherings during the summer outside. What can I do if I have a wasp infestation? It is recommended to seek the services of a trained Pest Control professional to eliminate pests for thorough results and to avoid stings. Help, there's a wet stain on my ceiling and I hear scratching late at night. Yellow jackets have been known to nest in attics. There nests get so large (and the wasps cause structural damage by chewing away at wood and plaster) that the nest can come crashing down through your ceiling. If you spot a stain on your ceiling, never poke at it, or you might be surprised by hundreds of yellow jackets swarming you within seconds. What should I do if I get stung by a wasp? Unlike a bee sting, a wasp won't leave a stinger in you. Watch the area closely as you may be allergic. You take an over the counter histamine if you have mild swelling. If you experience any throat swelling, seek emergency medical attention immediately.